The film is directly based on the director's own childhood. In the summer of 1993, following the death of her parents, six year old Frida moves from Barcelona to the Catalan countryside to live with her aunt and uncle, now her new legal guardians. Country life is a challenge for Frida – time passes differently, and the nature that surrounds her is mysterious. She now has a new little sister whom she has to take care of, and has to deal with new feelings, such as jealousy. Often, Frida is naively convinced that running away would be the best solution to her problems. Yet, the family does what it can to achieve a fragile new balance and bring normality to their life. Occasional family outings to a local fiesta or a swimming pool, cooking or listening to jazz in the garden bring them moments of happiness. Slowly, Frida realizes that she is there to stay and has to adapt to the new environment. Before the summer is over, she has to cope with her emotions and her new parents have to learn to love her as their own daughter. Coming in later September: Theatre Chipping Norton (13/9), David Lean Croydon (13/9), Errol Flynn Northampton (17/9), Film Theatre Reading (18/9), Film Theatre Stoke (20/9), Royal Leamington Spa (21/9), back again at the New Park Chichester (21-23/9), Eden Court Inverness (21/9), South Hill Park Bracknell (24/9), Robert Burns Dumfries (24/9), Palace Broadstairs (25 & 26/9), Film Theatre Ipswich (27/9). In October and later: Assembly Rooms Ludlow, Stroud Theatre Street, Theatr Mwldan, Alhambra Keswick, No 8 Pershore. Carla Simón (1983) studied at the University of California and the Audiovisual Communication Department of Universitat Autònoma of Barcelona. After that she directed TV series and programmes for TV Catalan. After being awarded the prestigious scholarship of Obra Social “la Caixa”, Carla moved to the UK to study at the London Film School, where she wrote and directed the documentary Born Positive and the fiction Lipstick, both short films selected in numerous international film festivals. Summer 1993 is her feature film debut produced by Inicia Films and co-produced by Avalon. The project was developed at Berlinale Script Station, Ekran program in Poland, Sources 2 in Barcelona and won the SGAE screenwriting fund. It was also presented at the Low Budget Film Forum in Les Arcs, Premiers Plans Atelier, Berlinale Co-Production Market and won the first prize in Holland Film Meetings in 2015. The film also received the MEDIA Development funding and the ICAA fund for production. In 2013 Carla created Young For Film!, an association which taught cinema to children and teenagers. Since moving back to Barcelona, she has been collaborating with “Cinema en Curs”. "Stunning drama...brilliantly realised...miraculous child performances...a jewel. In its subtlety, richness and warmth it is entirely beguiling - complex and simple at the same time. It is also very moving...What a lovely film it is." "An utterly beguiling debut feature from Spanish writer-director Carla Simón." ‘Eloquent…a finely crafted portrait of personal upheaval...It’s such a sad, wise insight into the way children process grief, the way happiness and mourning can coexist. It destroyed me." 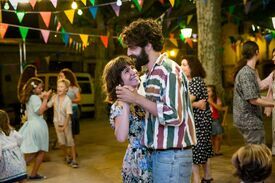 "Carla Simón’s debut feature Summer 1993 is a gem of a film by any standards, but when you learn that its story is based closely on the thirtysomething Catalan director’s own early life, its intimacy becomes almost overwhelming. It has at its heart a simply terrific performance from Laia Artigas as Simón’s six-year-old heroine Frida, the intonations of her face conveying variations of emotion that are powerful beyond anything words could achieve. It's a profoundly humanistic film, bringing home powerfully the sheer achievement of parenthood, as well as how the surrounding society comes through to show its implicit tolerance...A small, but very special film." "So lovely it hurts. The film is just right for this sultry weather. Don't miss the chance to be transported." "Simón is building to something here, but she does so in such an unobtrusive manner, allowing small moments to unfold and build in a way that, despite a running time only a little over 90 minutes, has a languorous approach that contributes to the summery feel of the film. Even when the emotional crux of the film comes, Simón never overplays her hand. A hugely impressive directorial debut." 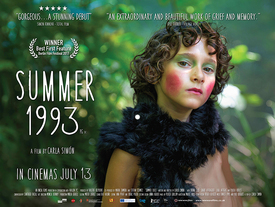 "A fantastic debut...Summer 1993 burns slowly across the screen"
"Spain has produced some of cinema’s most resonant child protagonists and there is something of the spirit of Saura’s Cría Cuervos and Erice’s The Spirit of the Beehive in Carla Simón’s beautifully crafted film. Balancing an acute sense of place and time with a broader autobiographical slant, Summer 1993 is a distinctive film realised with heartfelt sensitivity and a keen sense of visual poetry."